Mixed clouds and sun with scattered thunderstorms. High 79F. Winds SSW at 10 to 20 mph. Chance of rain 40%..
Mostly cloudy skies. Slight chance of a rain shower. Low 58F. Winds S at 5 to 10 mph. 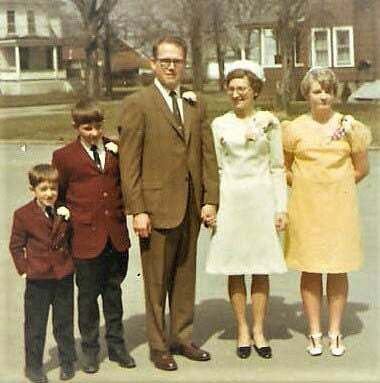 Taken in the church parking lot on the day of Jim and Evelyn’s wedding: (from left) Tim, Bill, Jim, Evelyn, and Wendy. 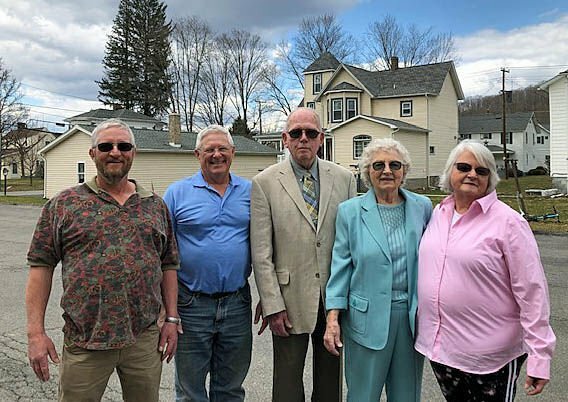 This posed photo was taken in the same spot as the original wedding photo with the same people, just 50 years later. A common greeting on Christmas cards and other notes might say, “Another year has passed and here we are again!” In our case, that very thing has passed – another year has passed … since we celebrated our wedding anniversary the last time. Evelyn and I were married on the 4th of April and that year, Easter Sunday was April 6th so we actually exchanged our vows on Good Friday. What better day could we have chosen? I had met Evelyn at PTA. She was a “P” and I was a “T” and together we made the “A”. She was a young widow with three young children. Although I had already been introduced to daughter Wendy through my 7th grade arithmetic class, I first met son Bill on a double date. I invited Evelyn and the two older kids to go along to a high school football game at East Brady. We delivered little son Tim to his grandparents and then drove down to the game. By the time the game was over, a layer of heavy, wet snow had fallen across the land making travel difficult. To seek a break from snow-covered roads, we stopped for dinner at the Gold Eagle in Brookville, our first dinner date with the family. By the next Christmas Eve, I had decided to get down on bended knee and ask for Evelyn’s hand in marriage. She had bought a new desk for one of the boys that required assembly, so I volunteered to help. Like many assembly jobs, it seemed to take forever after the kids went to bed, but somewhere between sunset and midnight, I made the proposal and she accepted. About that time, the phone rang and it was my dad calling to see if I was okay since his 31-year-old little boy hadn’t come home! In those days of long ago, teachers didn’t have anything called “personal days” so it was a logical move to be married over a regular holiday on the school calendar. We had been cautious about getting our marriage license too far ahead. In that era, the license list was published in the paper weekly and we were keeping the date a secret since our two older kids and I were well known around the school. With blood tests already taken, we knew school would dismiss early on Thursday afternoon, so we planned to drive down to Brookville for our marriage license that day. Of all things to happen, former President Eisenhower had died on March 28th and various services continued through the first week of April with a time of national mourning and closing of all government offices, including the Jefferson County Courthouse. I made an emergency call to our friend Dale Corbin who made a special trip to Brookville to open the office for us and to issue the license, all of which allowed us to stay on schedule. Remembering the anniversary date isn’t easy either. Good Friday falls on a different day on the calendar year by year. I suppose it could even fall on April Fool’s Day now and then. I even have a hard time telling how long ago it was because the number keeps changing every year – like my age. I have to stop and do a subtraction/addition problem to determine the number of years, complicated by the fact that my life now spans two centuries. Our knot was tied by Rev. Dan Little in the Brockway Presbyterian Church. We held a small reception dinner in our newly-constructed home with two ladies from the school cafeteria, Anna Adams and Nita Himes as cooks. I knew we could depend on them for a good meal since they had already been feeding me with their fine cooking for many years of school lunches. After the dinner and pictures, we sent the family on their own ways, packed the kids off with their Grandmother Hicks, and headed east on the brand new Interstate 80 for the weekend. When it comes to rating Good Fridays, that one was a TEN! My elderly Aunt Catherine Cooper Thorp lived in Philadelphia and wasn’t physically able to come to our wedding, so we planned our honeymoon trip to include church in Philadelphia on Easter morning with her and her daughter Elizabeth. Early Sunday morning, we picked them up and drove to the Tenth Presbyterian Church in the heart of the city where Dr. Donald Grey Barnhouse was the senior pastor, a well-known radio evangelist of his day, and a mentor for Dr. D. James Kennedy who became well-known for his television ministry from the Coral Ridge Presbyterian Church near Ft. Lauderdale in Florida. We climbed the front steps to the massive, old-city church and entered into the back of the beautiful sanctuary, walking in beneath a large balcony and moving to the seats of Aunt Catherine’s choice. Almost immediately there was a heavy drum roll from kettle drums on the balcony, followed by trumpeting from a set of those long, key-less instruments like people of old times used to announce the arrival of royalty. It was one of the most moving experiences of our lives as we found ourselves among the most diverse population of the city, obviously the poor and the rich, the young and the old, those who were there to celebrate the meaning of the day, and of the Easter season. After having some lunch with my relatives, and sightseeing around the neighborhood of Independence Hall, we began to plan our trip back home. Before leaving the city, we looked for a place for another good meal. We spotted a little roadhouse where two dusty travelers wouldn’t attract attention — or so we thought. Once inside we found it to be a classy place where the waiters wore black ties and carried a towel over their left arm, there was a piano player tinkling out familiar tunes, and even a drunk hanging on the bar in Bogart movie style. The beef stroganoff was served in a fiery pot right at the table. Once back on the road, we found the PA Turnpike and headed west. That was just what my dad feared and he had no way of warning us of danger! He had been following the news story about a shooter riding up and down the Turnpike blasting passing motorists with a shotgun and leaving behind a trail of wrecked cars and at least three people dead. Sure enough we were right there on that very day, but we knew nothing of that day’s events and just motored on home. That all took place over the Easter weekend exactly 50 years ago. By the calendar, it has been a long time. By our lives, it has rolled along far too quickly … and it continues today. Last Saturday evening, we held an anniversary dinner at the Hut Family Restaurant outside Brockway at Crenshaw where hostess Andrea Bassetti arranged for an excellent meal and even a special cake with gold icing for our family, which now numbers to 30 or more Our friends say they are looking forward to the continuing with us for the next 50 years as well.